Home > General > I’m a new mom, help! It’s been a long time since I was a new Mom, 38 years to be exact, but I remember it like it was yesterday. I was terrified! You know, babies don’t come with instructions, nor do our bodies, for that matter. When I had my daughter, breastfeeding was the “big thing,” My Mom’s generation usually didn’t nurse their babies; we were “bottle babies.” I had no one close to ask for advice on breastfeeding. All I had was a very scary nurse, who rolled her eyes at me every time I asked a question. I was so nervous, needless to say, breastfeeding almost didn’t happen for my baby girl and me. This is just one example of how much this 21 years old could have used the amazing training a young Mom gets when she comes to PRC! 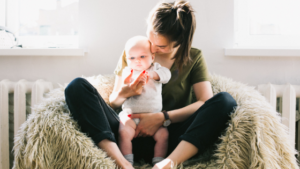 Our patients can learn about anything from pre-natal care, nutrition, your changing body, to breastfeeding, baby CPR, and just about anything about parenting. While doing this, they also receive diapers and wipes at every appointment as well as “baby bucks” to purchase much-needed items for their little one. Luckily my parents and in-laws were very helpful when it came to meeting many of those baby needs. But many women don’t have a support system like I was blessed to have. If it weren’t for PRC and the generosity of our many donors, their child might not even have the basics needed to come from the hospital. In our Baby Boutique, we offer car seats, strollers, Pack-n-Plays, clothing, towels, bottles, blankets, baby hygiene items and so much more! This can help relieve some of the stress from a Mom who is feeling completely overwhelmed about her circumstances. One of the greatest services we offer a new Mom is a relationship. We have advocates who are there to walk with her through her pregnancy with her as well as being there for her after her baby arrives. Our advocates teach, encourage, and love our patients. They also keep us abreast of any emergencies that may require special attention such as housing, medical needs or mentoring for the Father of the baby. Our patients don’t just have an advocate; they have a friend who shares not only “life” with them but the love of Christ! Think you might be pregnant? PRC offers free, confidential pregnancy tests for women who think they might be pregnant. Make an appointment with us today, and get the answers you need.